Two former Canberrans with a love for gin have made their dream of opening a small distillery in Sydney a reality. Like many young Canberrans, Griffin Blumer and Jesse Kennedy moved to Sydney’s Inner West in their early twenties. They are now opening a small gin distillery, Poor Toms, in Marrickville, and hope to release their first batch of Sydney Dry Gin in May. When they started this project at the beginning of 2014 there were no other distilleries in Sydney, but in the past month they have witnessed the release of two independent Sydney gin labels. However, they think they have developed a product that is unique among gins. 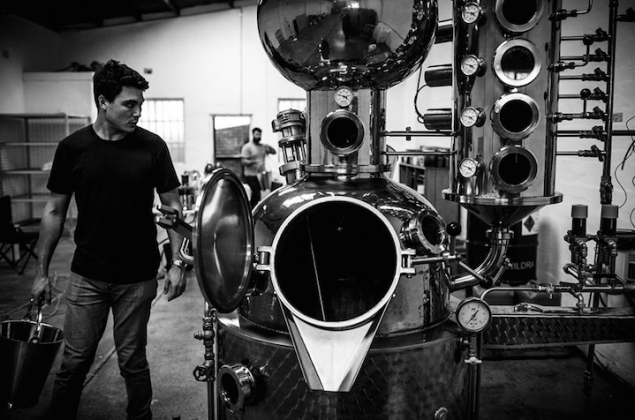 The young distillers have installed a 200L German copper pot still (named Jane in honour of their Year 7 English teacher) and their scale is much smaller than other independent Australian gin makers. They aren’t cutting any corners. They have sourced a special gum leaf, strawberry gum, native to New South Wales. They are also hand juicing fresh Granny Smith apples. They wear their outsider status in Sydney with pride. Their Canberra connections have been vital to their progress so far. Several young Canberra expats are involved in the project. Amy Donaldson, who met Griffin when they both attended Narrabundah College, is doing the design work for Poor Toms. Photographer Dom Lorrimer has been documenting the process. Dom and fellow Narrabundah College alumnus, Ollie Williams, are helping Poor Toms produce a video to launch the first batch of gin in May. Although they are still waiting for some licensing paperwork to be cleared, they are aiming to release their batch on Pozible, a crowd funding website, very soon. For further details, find Poor Toms on Facebook.